'Empress Josephine' (Dorman Haymon, R. 1989). Seedling 37-84-9. LA, 32" (81 cm), Midseason to late bloom. 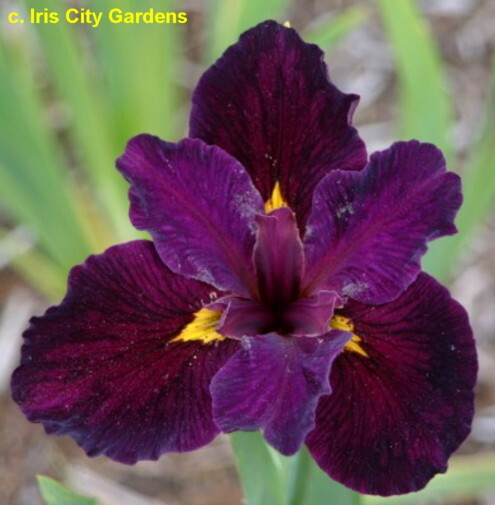 Ruffled velvety dark red violet, veined and streaked black, bright gold yellow spearhead signal; dark red violet styles edged cream. 'Full Eclipse' X 'Ann Chowning'. Deep South Garden 1990. From AIS Bulletin #277 April 1990 Introducing. EMPRESS JOSEPHINE-Ruffled, velvety dark red violet veined and streaked black, bright gold yellow spearhead signal; dark red violet styles edged cream. (Full Eclipse X Ann Chowning). $30.00. Deep South Garden.